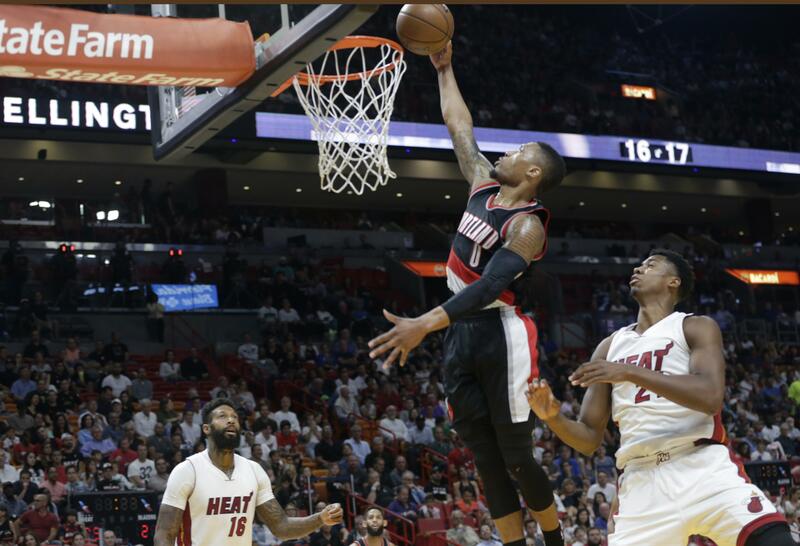 Sun., March 19, 2017, 10:44 p.m.
MIAMI – Damian Lillard scored a season-high 49 points, 28 after halftime, and the Portland Trail Blazers continued their playoff push by beating the Miami Heat 115-104 on Sunday night. Lillard tied a career high with nine 3-pointers, giving him 1,002 for his career. He shot 14 for 21 from the field, 9 for 12 from 3-point range and made all 12 of his free throws. Jusef Nurkic added 21 points and 12 rebounds for Portland (32-37), which moved within a game of idle Denver for the No. 8 spot in the Western Conference. C.J. McCollum scored 18 points and Noah Vonleh added 11 for the Trail Blazers. James Johnson scored 24 points for Miami, which lost for just the second time in its last 17 home games. The Heat (34-36) missed a chance to reach .500 for the first time this season and fell to 7-17 when Dion Waiters isn’t in the lineup. Waiters is out with a sprained ankle. The Heat are 27-19 when he plays. LOS ANGELES – Kyrie Irving scored 46 points, LeBron James added 34 and Cleveland had to rally from an 11-point deficit in the fourth quarter to edge Los Angeles. Kevin Love had 21 points and 15 rebounds for the Cavaliers, who needed every bit of their full lineup to withstand a surprising challenge from the Western Conference’s last-place team and clinch a playoff spot. James, Love and Irving all sat out the defending champions’ blowout loss to the Clippers on Saturday, angering fans and the national television audience. That night off left them with the energy to lead a 43-point fourth quarter. D’Angelo Russell scored a career-high 40 points in a spectacular return to the starting lineup for the Lakers, who have lost five straight and 13 of 14. Russell hit seven 3-pointers and had six assists while committing just one turnover in 41 minutes. SAN ANTONIO – Pau Gasol scored 22 points, LaMarcus Aldridge added 18 and San Antonio rolled past Sacramento to snap a two-game skid. Kawhi Leonard had 12 points in 27 minutes, sitting out the fourth quarter after the Spurs led by as many as 28. San Antonio (53-16) moved within two games of idle Golden State (55-14) for the NBA’s best record. Buddy Hield had 18 points, matching his high with the Kings since being acquired Feb. 20 in the trade that sent All-Star big man DeMarcus Cousins to New Orleans. The Spurs had to overcome an abysmal start to win their 10th straight over the Kings. San Antonio missed its first eight shots and 12 of 13 in falling behind 14-2. PHILADELPHIA – Robert Covington made the go-ahead 3-pointer late in the fourth quarter to lift Philadelphia over Boston. Dario Saric scored key baskets to extend the lead and bolster his bid for NBA Rookie of the Year. Saric had 23 points and helped rally the 76ers from a 13-point hole in the third. Covington buried a 3 with 3:37 left that put the Sixers up 94-91, and Nik Stauskas hit his own with 38 seconds left for a 103-97 lead that sent fans inside a packed Wells Fargo Center into a frenzy. The Sixers, who thumped Dallas 116-74 on Friday night, improved to a respectable 17-19 at home. They won 10 games total last season. Al Horford led the Celtics with a season-high 27 points. Boston guard Isaiah Thomas sat out a second straight game with a bone bruise on his right knee and is questionable for Monday at Washington. TORONTO – DeMar DeRozan scored 22 points in three quarters, and all five Toronto starters were in double figures against Indiana. DeRozan added four assists and three rebounds and was able to rest the entire fourth quarter as the Raptors cruised to their second straight victory. Serge Ibaka had 16 points, while Jonas Valanciunas finished with 11 points and 13 rebounds as the Raptors improved to 41-29. Paul George had 18 points for the Pacers, who lost to Toronto for the eighth time in the last nine regular-season meetings. It was the first meeting between the teams since Game 7 of last year’s first-round playoff series, which was won by Toronto. They face each other twice more over the next two weeks. NEW YORK – Dirk Nowitzki had 23 points and nine rebounds as Dallas beat Brooklyn. J.J. Barea scored 20 points and Harrison Barnes added 19 for the Mavericks. Brook Lopez had 27 points and Spencer Dinwiddie scored 18 for the Nets. The Mavericks led 94-92 with more than five minutes left before Barea scored nine straight Dallas points. Barnes followed with two layups that made it 107-101 with 26.5 seconds remaining. AUBURN HILLS, Mich. – Kentavious Caldwell-Pope scored 23 points and Detroit overcame a sluggish performance for the much of the game, finally pulling away from short-handed Phoenix. The Suns were without several top players, but they still led the playoff-chasing Pistons 65-53 in the third quarter. Detroit finished strong in that period and then built a double-digit lead of its own in the fourth. Andre Drummond had 18 points and 18 rebounds for the Pistons, and Aron Baynes had 13 points and 17 rebounds. Tyler Ulis had 17 points and 11 assists for the Suns. Phoenix was without guard Devin Booker (right ankle), guard Ronnie Price (left leg), guard Leandro Barbosa (illness) and forward Dragan Bender (right ankle). The Suns have also been playing without Eric Bledsoe, Brandon Knight and Tyson Chandler, choosing to give young players more time. NEW ORLEANS – Anthony Davis had 28 points and 12 rebounds to lead New Orleans past struggling Minnesota. DeMarcus Cousins added 15 points and 11 rebounds in his return from a one-game absence because of left knee and rib soreness. Reserve guard Jordan Crawford scored a season-high 22 points in 21 minutes for the Pelicans, who have won four of five. Jrue Holiday had 21 points and shot 4 of 5 from 3-point range. Karl-Anthony Towns scored 33 for the Timberwolves, who lost their third straight. Andrew Wiggins added 25 points and reserve Shabazz Muhammad had 20 for Minnesota. Ricky Rubio chipped in with 10 points and 14 assists for the Wolves, who built a 13-point lead in the second quarter only to fade late as New Orleans closed the game on a 21-10 run. Published: March 19, 2017, 10:44 p.m.